Quang Nam (VNA) – The central province of Quang Nam is building bridges in disadvantaged and frequently flood-hit areas to facilitate local people’s livelihoods. It will spend nearly 72 billion VND (3.16 million USD) sourced from the LRAMP project of the Transport Ministry on the effort. Some 36 new bridges will be built in the mountainous districts of Tay Giang, Phuoc Son, Que Son, Hiep Duc, Nong Son, Bac Tra My and Nam Tra My, and in flood-hit localities in lowland areas of Phu Ninh, Duy Xuyen and Tien Phuoc. Fifteen bridges are expected to come into use before the rainy season of 2017, while the remainder will be completed by 2018. 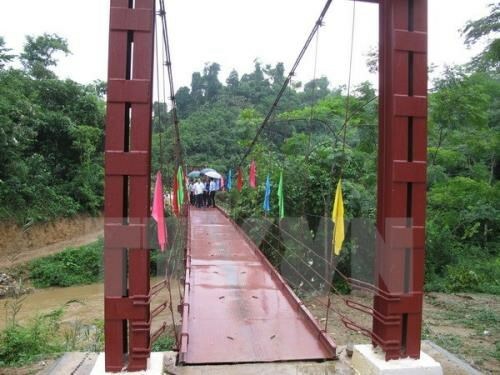 The province has invested more than 100 billion VND (4.39 million USD) over the last three years to build bridges in disadvantaged areas of mountainous districts. In 2016, 59 suspension and steel-reinforced concrete bridges were constructed in those areas, mainly resided by the ethnic minorities groups. The province also renewed 170km of concrete roads and built over 250 sewers.